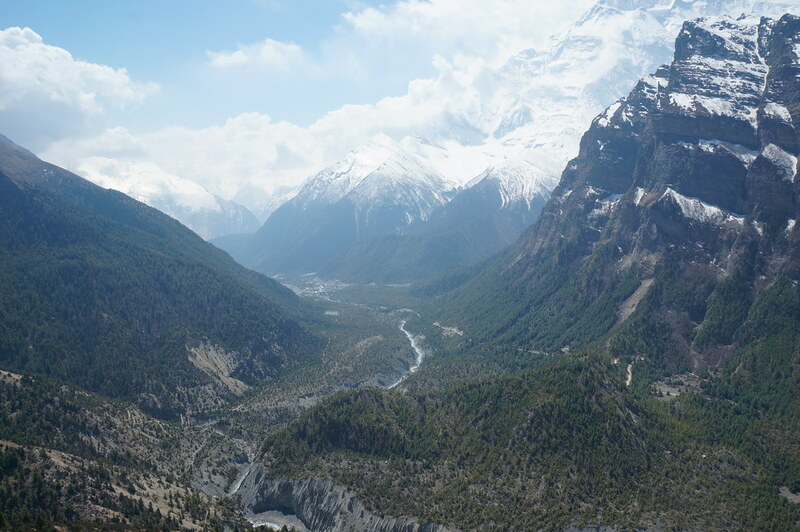 There are two routes to reach Bragha and Manang, the upper route which goes from Upper Pisang and stays high via Ghyaru (pronounced GUY A RU) and Ngawal (pronounced NAR WAL) and the low route which follows the road from Lower Pisang to Bragha. 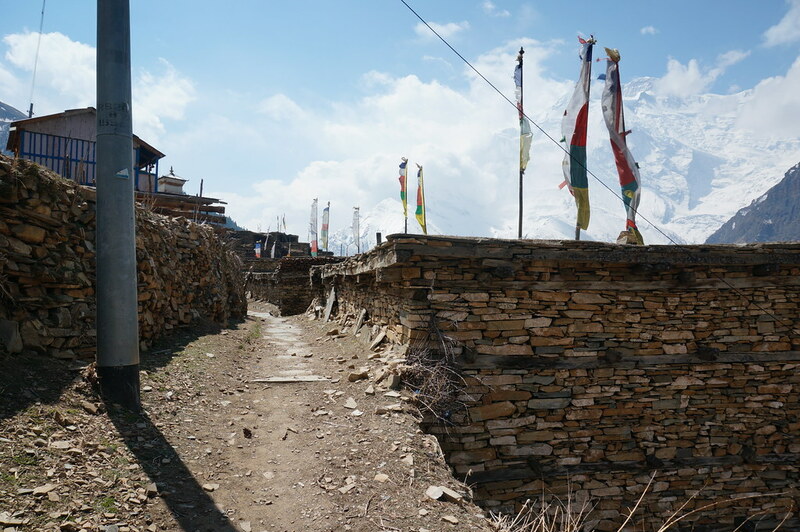 The lower route is boring, as a road it’s great in getting you from A to B quickly and efficiently, but as a trekking route it’s a waste of a good walk. 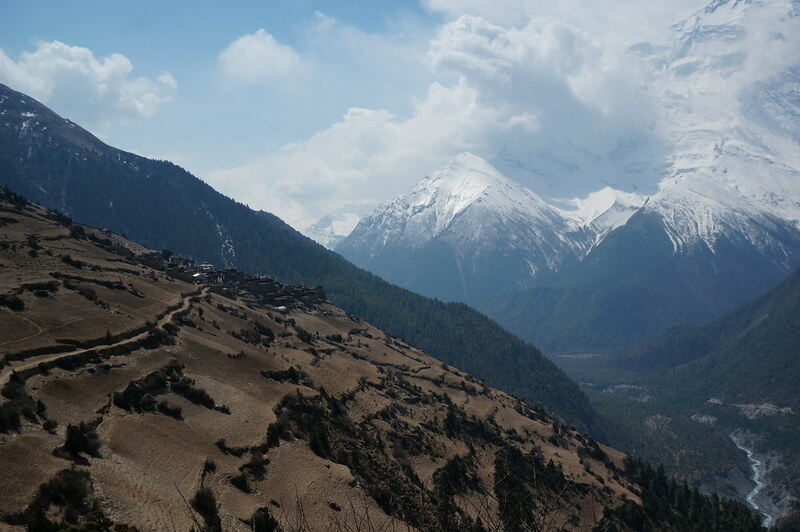 We told Harry to take the lower route as it’s far easier and we’d take the upper route and then meet him in the afternoon in Mungji (pronounced MUN JAY). 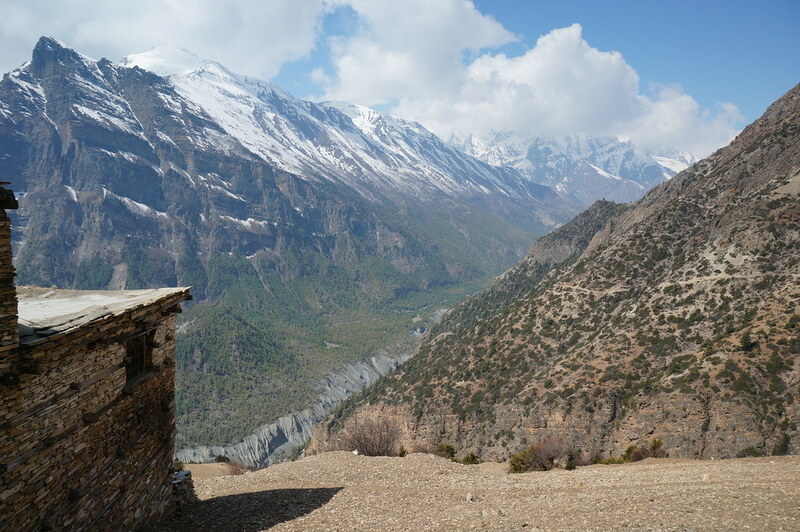 We left Upper Pisang following the path around the edge of the hillside. The walk here was good. The sky was a deep blue, the mountains were clear and snow capped and we were continuing to walk through a thin line of forest. After about 30 minutes we reached the bottom of a steep hill. 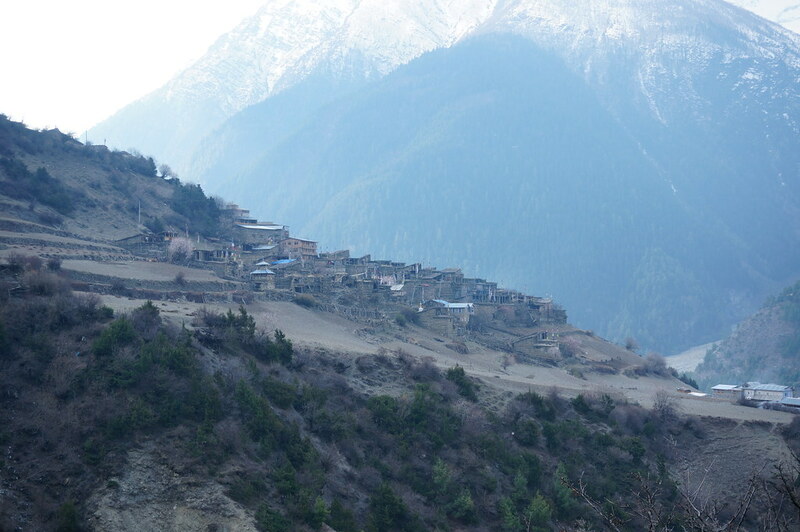 The path was a long series of switchbacks and at the top we could see the village of Ghyaru. This was probably a 300m climb in front of us. The path was steep and the sun was shining on the yellow dusty ground. Annemarie’s calve muscle became very tight and she struggled her way up, but still passed plenty of other trekkers who were already a third of the way up when we reached the bottom. I was able to march up a bit faster but reached the top dripping in sweat. Although it was still very early we stopped at the top for a cup of tea and a chocolate bar. 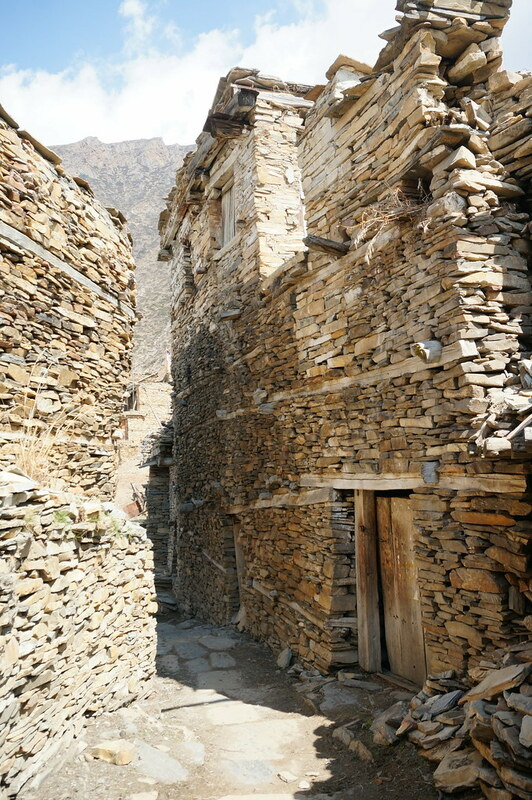 The village of Ghyaru is a traditional village and the buildings there are still in the old style. The tea took ages to arrive and we were stopped in Ghyaru for about 45 minutes. After leaving the village we had great views looking back at it. The walk to Ngawal was quite scenic. 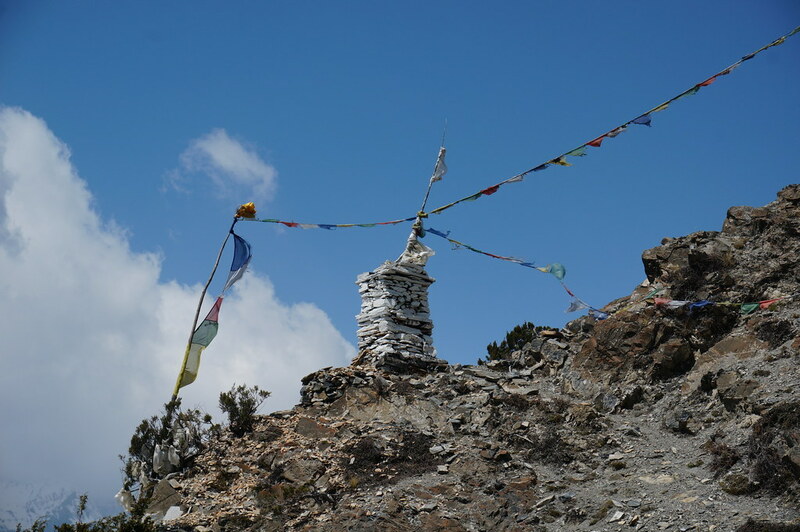 It mainly stuck to the hillside and we passed by many Chortens and other religious symbols. The views of the valley were pretty good too. 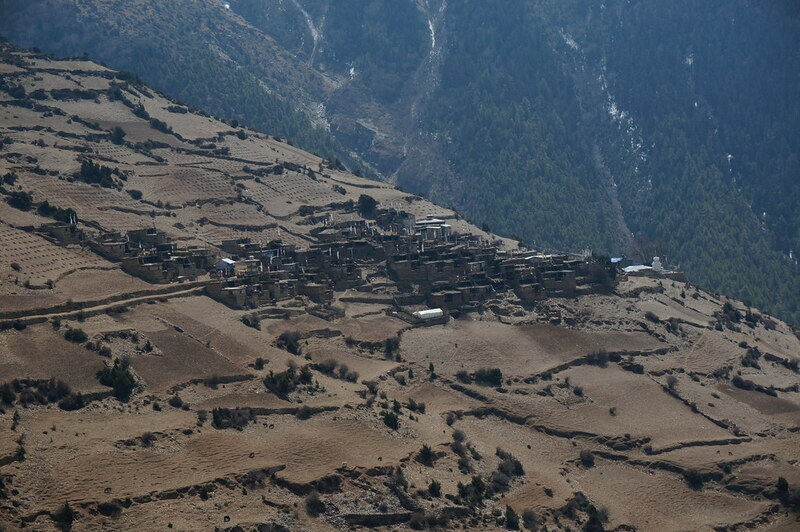 Ngawal was another traditional looking village, although there were many lodges and restaurants here. 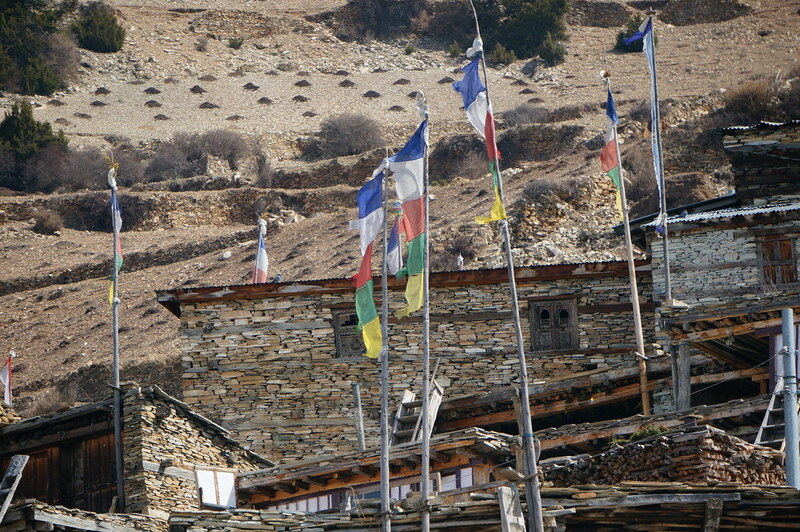 We saw one British guy at a lodge just before the village, but apart from him we saw no-one else in the village! 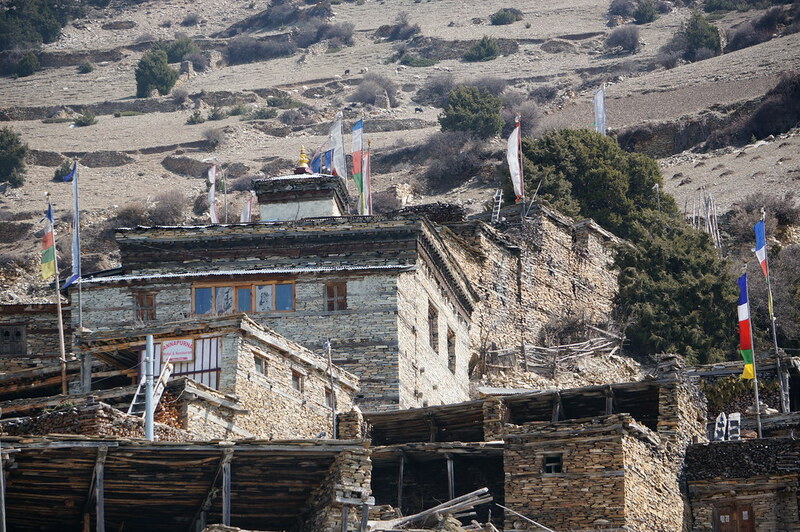 All the buildings in the village had flat roofs which were used for everyday activities. Many buildings were three floors high, so the streets were deep down between the buildings and rather dark because they were narrow too. We went into a restaurant which had rooftop seating and ordered. Annemarie had a traditional Tibetan dish whilst me and Marco had usual trekking food (Marco had Dal Bhat and I had fried rice). The food took over an hour to arrive and we were getting worried about how long we had spent waiting for food and drinks. Harry would be wondering where we were since the lower route was a couple of hours faster. After lunch we followed the path out of Ngawal and down into the valley. This wasn’t very interesting, just more of the same scenery we’d had all day. We did see another fort, again high up above the valley. 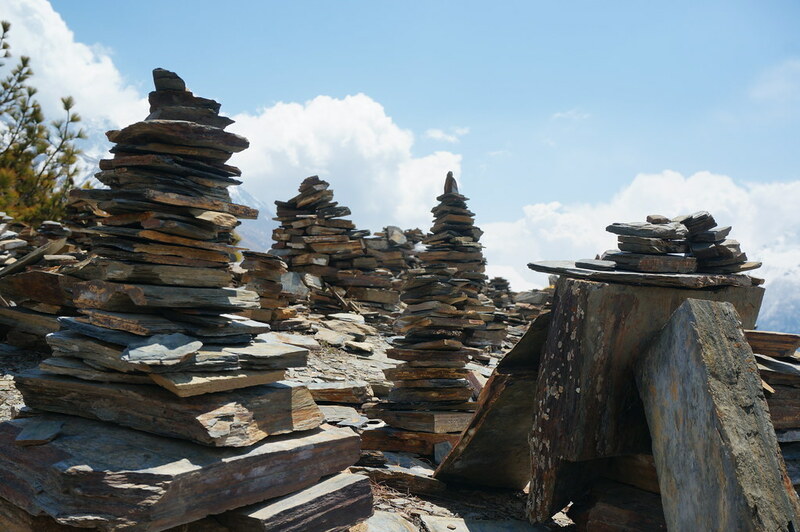 We assumed this was part of a warning system as the other fort was high up in Upper Pisang, good for warnings but not so good to stop the enemy. As we walked we could see the clouds ahead of us literally coming down the side of the mountain into the valley. It rapidly got colder and darker. Soon it started to spot with rain, which then got heavier until it was raining hard. This was the first time on this trek that it had rained on us, 6 days isn’t bad I suppose. We grabbed our ponchos and continued. Finally we reached Mungji and found Harry waiting for us in one of the restaurants. We went in and had a cup of tea to keep warm, whilst hoping the rain would stop soon. 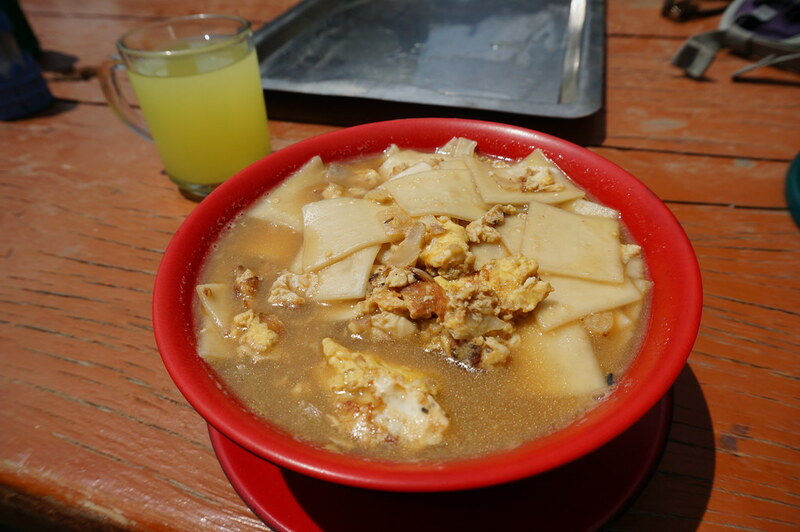 I had a warm Seabuckthorn juice, which was good. It didn’t stop raining so we had no choice but to set off in the rain, which was becoming more like sleet every minute. It was only a short walk of about 15 minutes to reach Bragha. Our preferred lodge which was recommended in the Lonely Planet was full, which was a surprise as so far the most people we’d seen in a lodge was 4 others! The lodge next door was basic and the final lodge was also full. We got a room in the basic lodge called the Hotel Buddha. The lodge was empty, which should have rung alarm bells as the lodges on either side were full. It wasn’t great but we’d stayed in worse so we unpacked, hung our clothes up to dry and got into our warm clothing for the evening. 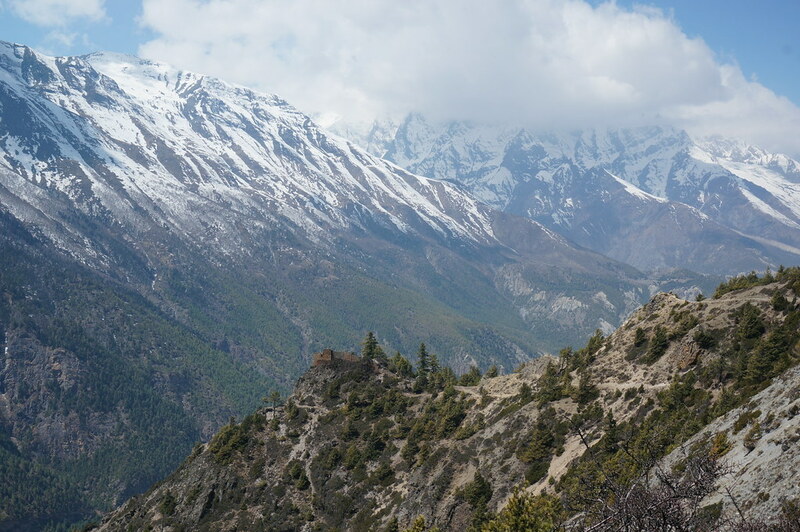 Marco decided he didn’t like it there and was going to walk up to Manang and find a decent lodge there. As we’d unpacked and got changed we couldn’t follow him without a huge amount of packing, so we said our goodbyes. The night was cold. It was snowing outside and inside there was us and the staff huddled around a single small stove trying to keep warm. We went to bed early because it was cold and we’d had enough of the staff staring silently at us. Funny. My daughter is also doing this trekking. Great stories and pictures. She is doung it in januari so it must be very cold.